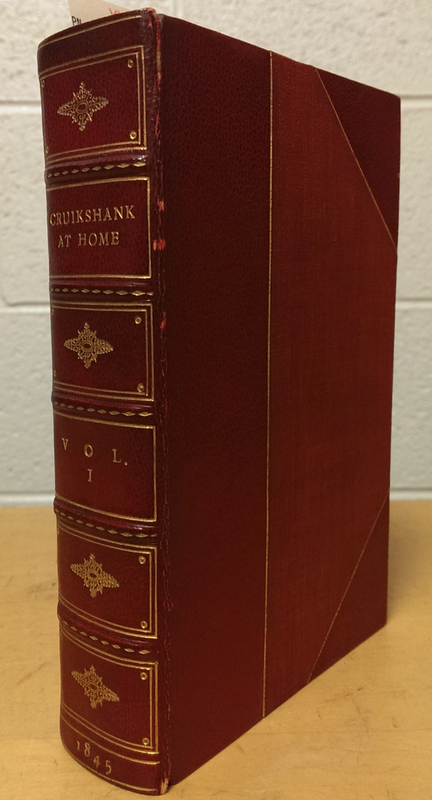 This 1845 edition of Cruikshank at Home (Vol. I), a collection of humorous short stories selected and illustrated by famed English caricature artist Robert Cruikshank, may seem at first glance to be rather unremarkable. While it is beautifully half-bound in red Morocco leather, it stands at a modest six-and-a-half inches tall and tends to blend in with the books around it on the vault shelves, many of which are similarly bound and just as beautiful. As the study of rare book provenance has shown again and again, however, often some the most interesting features of books can be found on flyleaves and endsheets — and our copy of Cruikshank at Home is no different in this regard. Presentation inscription from Samuel Clemens/Mark Twain. Search on the Web for Mark Twain’s (Samuel Langhorne Clemens) autograph and you’ll likely conclude that this is the real deal. And why shouldn’t it be? As in many institutions, our rare books contain signatures from a number of famous individuals, in the form of ownership inscriptions, presentation inscriptions, and the like. But what else can we potentially learn about the provenance of this volume? 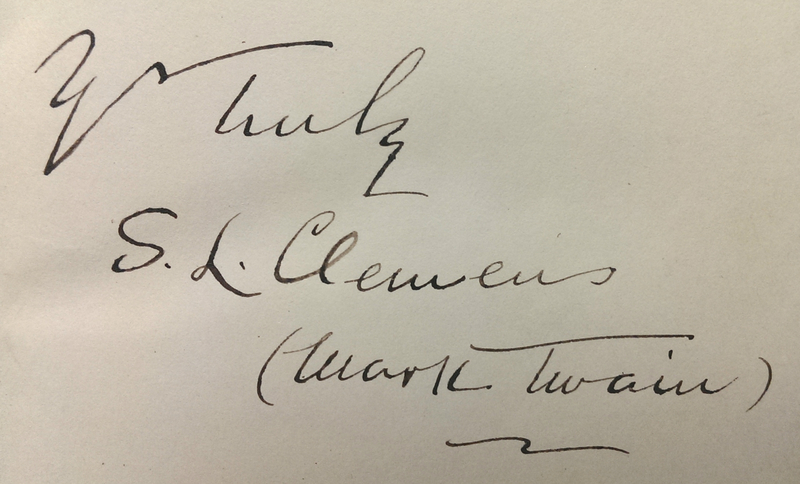 Close-up of the Clemens/Twain signature. 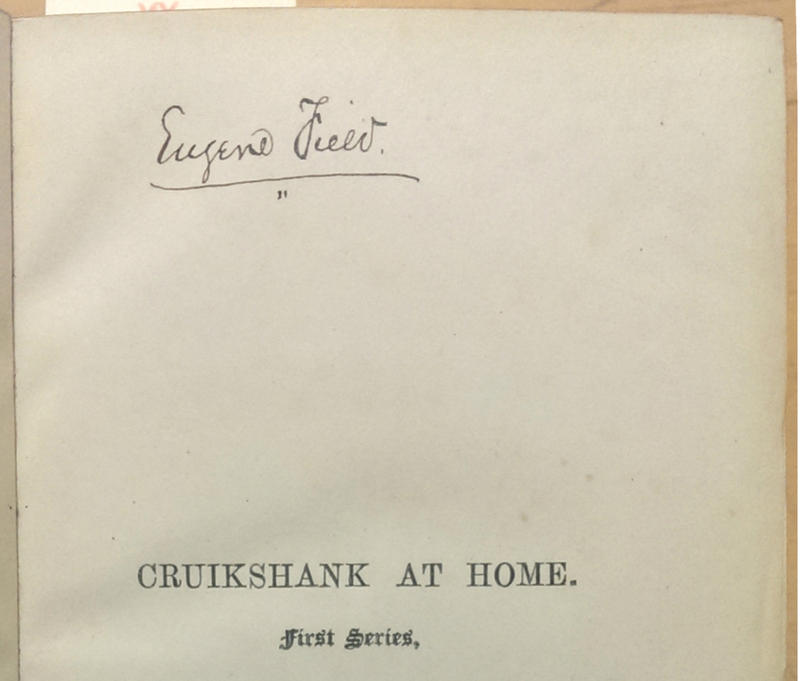 The book features another interesting signature on the half-title: that of late 19th century American author and poet Eugene Field. Based on the location and the appearance of the signature, it appears to be an ownership inscription, meaning that this book was likely in Field’s collection at some point. Signature of Eugene Field, Sr. 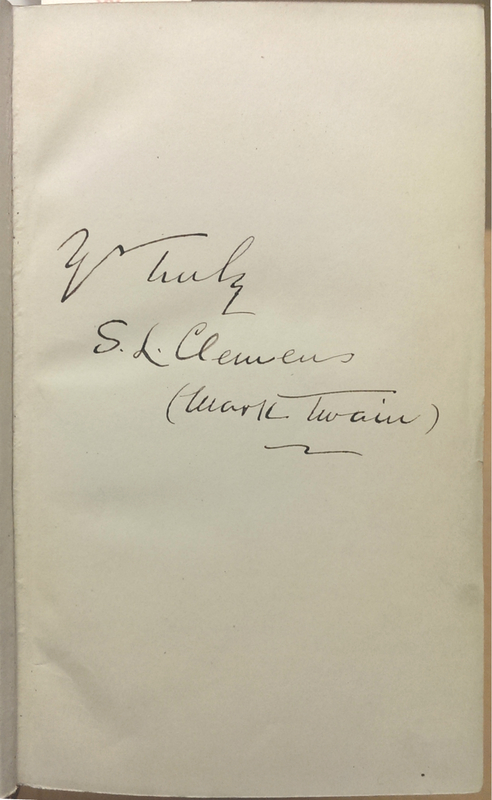 It seems probable that the two signatures are related, and that the book was either given to Field by Twain, or that Field merely had Twain sign it (although since it’s not a work by Twain, the latter seems less likely). The two authors were friends, or at least acquaintances, and it’s hardly a stretch of the imagination to picture such a presentation taking place. Note from Eugene Field, Jr. So, everything seems to be peachy — we have a fine example of a presentation inscription from one of the most influential American authors of all time, in a book from the personal collection of another famous author, all supported by the testimony of the latter’s son. [Eugene Field, Jr.] had grown up with a comfortable life in the suburbs of Chicago, and upon his father’s death, began casting about for ways to make money without doing much work. Eugene Sr. left… a sizeable library, filled with some rare editions and beautiful bindings, and Pinny began selling them off piecemeal for profit. As Pinny was quickly running through his father’s library, he began to dabble in forgeries, and sometime in the 1920s or early 1930s, he met up with forger Harry Dayton Sickles. The two quickly struck upon a plan to ‘increase’ Eugene Sr.’s library. They reproduced Eugene Sr.’s original bookplate, and then set about buying up books, forging signatures and inscriptions, and ‘authenticating’ them with the addition of the reproduced bookplates. [Field and Sickles] were also known to have forged numerous documents and signatures of other famous figures such as, Rudyard Kipling, Theodore Roosevelt and Samuel Clemens (Mark Twain), as well as several others. While it’s possible that our Twain inscription is authentic, it also seems as though we have good reason to question it. Could it be that the young Field falsified the signature early in his forgery career, or that he or Sickles, partners in crime, faked it in the late ’20s or ’30s and simply back-dated the “authenticating” note on the rear flyleaf? 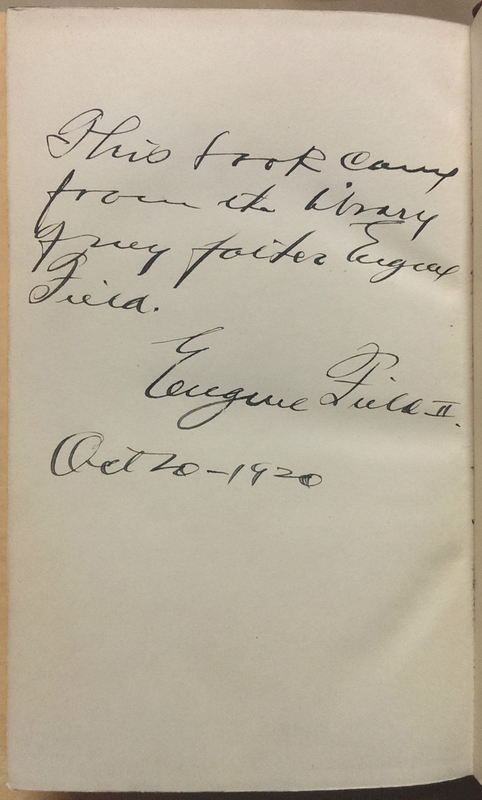 Was the book presented to Eugene Field, Sr. by his friend and colleague Mark Twain, or is the signature a forgery? We don’t know — and we may never know. The irony is that if this volume did not feature the note from Field’s son we likely would have never seriously questioned the autograph’s authenticity. What do you think? Can anyone out there offer any insight into the validity of these signatures?